Adjacent to the Walker is the Minneapolis Sculpture Garden, one of the nation's largest urban sculpture parks. When the Garden opened in 1988, it was immediately heralded by the New York Times as "the finest new outdoor space in the country for displaying sculpture." 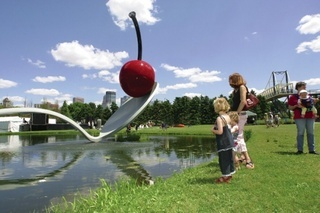 The Garden's centerpiece and most popular work is Claes Oldenburg and Coosje van Bruggen's Spoonbridge and Cherry (1985-1988), which has become a beloved symbol of the Twin Cities. The Garden has demonstrated extraordinary appeal in the community, and is a vital force for bringing new visitors inside the Walker and building new audiences for contemporary art. More than 15,000 people attended the Walker's Rock the Garden concert and 15th-Anniversary celebration in June 2003. Opened in April 2005, the new Walker Art Center, nearly double in size, includes increased indoor and outdoor facilities, allowing us to share more of our resources--from objects in the permanent collection to books in our library to an inside view of the artist's own creative process--with our growing audience. Increasingly, this ability to link ideas from different disciplines and art forms is seen as a model for cultural institutions of the future. A key aspect of the design is a "town square," a sequence of spaces that, like the Minneapolis Sculpture Garden, draws people for informal conversation, interactive learning, and community programs.